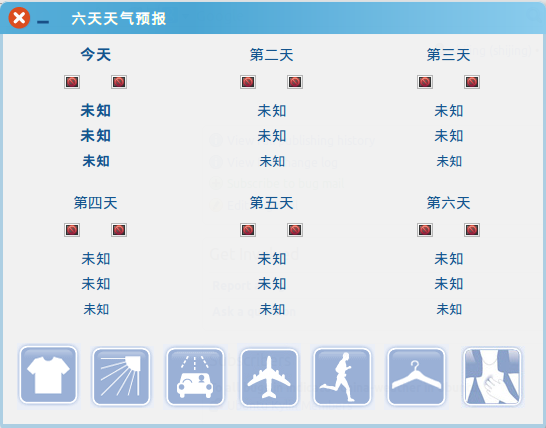 In the indicator-china-weather, weather report of six days does not display data correctly. As shown in figure weather.png in the attachment . Yes, when there is only one city ,it will not show weather forecast. I submit a patch to solve the bug. The attachment "show_normally_when_one_city.patch" seems to be a debdiff. The ubuntu-sponsors team has been subscribed to the bug report so that they can review and hopefully sponsor the debdiff. If the attachment isn't a patch, please remove the "patch" flag from the attachment, remove the "patch" tag, and if you are member of the ~ubuntu-sponsors, unsubscribe the team. @happyaron, would you please add this patch to the 1.1.0 release? the six day weather is still started with 2014-03-04 in the latest iso(2014-04-04) . The title of the dialog is "天气预报数据已停止更新".